Reviews of Writing Services at SmartWritingService.com - prices, discounts and coupons. SmartWritingService.com has been in the academic writing business for about 71/2 years. It is our policy to continue to provide evaluations of online writing services as we are able to get to them, and we have selected Smart Writing Services because it has been in business long enough to establish a long-term view of the quality of its product and services. This SmartWritingService review is based upon the same criteria that we use to assess all writing companies and includes an exploration of the site and site content, the Smart Writing Service testimonials that are published on the site, reviews and comments written by customers and published in other places on the web, and the results of an order that we placed for a research paper. All of these sources are then compiled to provide this summary. This company is purely for academic writing needs. Students from high school through graduate level studies may order any form of academic writing product, including essays, papers, presentations, research projects, case studies, coursework assignments, reviews and analyses, and theses. In addition to targeted academic writing, Smart Writing Service also offers admissions essay writing for students at all levels. Beyond that, we did not find editing, proofreading, or re-writing services listed. The site states that all of its writers are native English-speaking and possess either a Mater’s or Ph.D. in their writing fields. Off-site comments and reviews are mixed. While most customers stated that their instructions were followed and that their products were delivered on time, a number of former customers were disappointed with the quality of research and writing. Some commented that perhaps a foreign writer had produced their works; others stated that the resources used were not scholarly enough for their academic level, and that the style was also less rigorous than expected. Our experience mirrored that of many customers. We ordered an 8-page university-level research paper with a 7-day deadline. We did receive the product on the 7th day, as promised. However, we, too, had some concerns with quality. Language, style, and vocabulary were quite simplistic and two of the resources used were clearly at a high school level. We attempted to locate a SmartWritingService BBB membership but were unable to do so. We can state with confidence that SmartWritingService is not a scam. 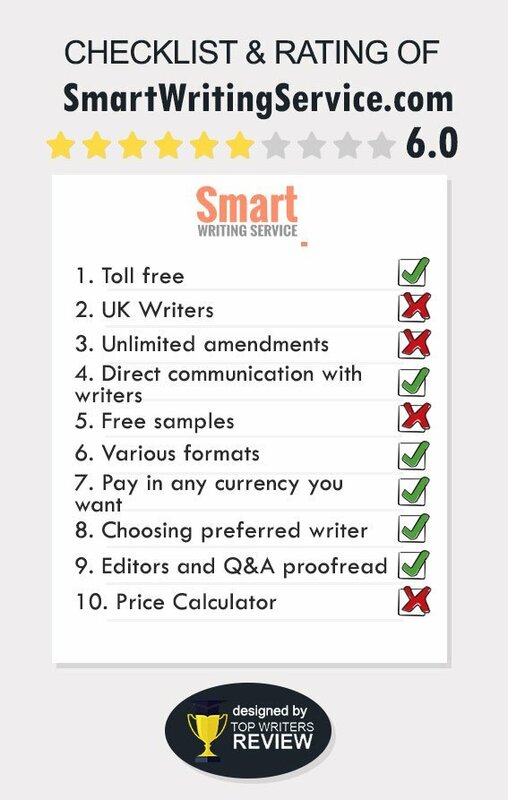 SmartWritingService.com prices are within the average range. 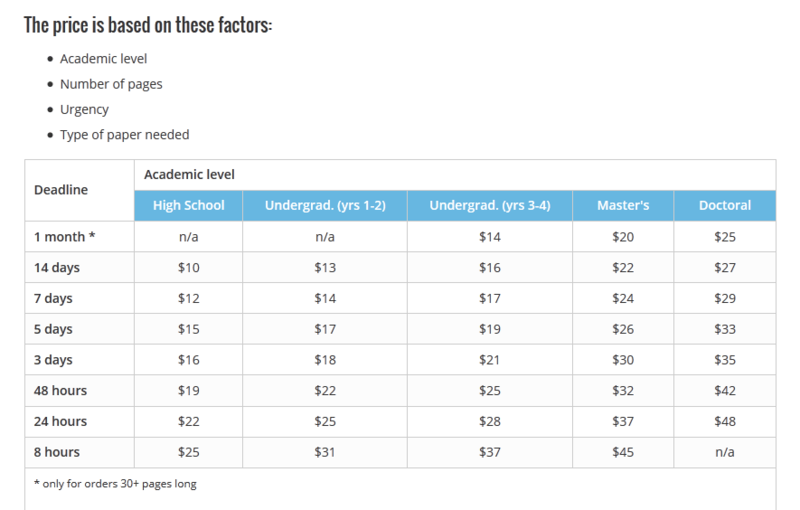 They begin at $10 per page for a basic high school essay and graduate to $48 per page for major doctoral-level research and writing. Prices vary by length, academic level, and deadline requirements. Our paper’s price tag was $136.00. Customers may use any major credit card, PayPal or Moneybookers for payment, and there is a secured third-party system in place to protect financial information. Relative to SmartWritingService discounts, we were unable to find a link that would describe the discount policy. Nor were we able to fine a Smart Writing Service promo code, such as is usually offered for first-time customers. Also normal for most other sites is a discount program based upon number of orders placed. We could find no such program nor was there any mention of SmartWritingService.com coupon codes which is commonplace. We can conclude that no discount program exsits. We also were unable to locate any mention of free pages which are common – title page, outline, bibliography, or table of contents. Revisions are free within a specified period of time, and the site states that is does run a plagiarism check on all of its products before delivery. I worked with these guys twice and can say that they deliver orders on time and offer nice discounts. But what I had to do after their writer is to proofread the text, add some passages and finish the list of references. Not the type of service I paid for. I suffered through years of high school when my literature teacher gave us super long essays every week. I promised myself I would never have to do it again ad that's why I turned to Smart Writing. Well, after having received my order I reconsidered my values since the writing skills I acquired in school helped me to rewrite the monstrosity this nice-looking company gave me for my money. I hated my teacher in high school who assigned us 4,000 words essays weekly and thought I would never suffer like that again. Well, now I’m grateful for this experience since it helped me to edit and rewrite that disaster I received from Smart Writing and turn my paper in on time. Well, at least I managed to use what I payed money for. I like their newspaper-like design and interactive elements on the website (web designer detected, huh?). I don’t really understand why those beautiful responsive buttons do not have links to click? Therefore I was embarrassed for a fracture of a second and didn’t know how to navigate the site. Obviously they are not well-off since they can’t hire a good designer. Or, they are not well-off because their poor website drives customers away?